This year, I went with a feminine and pastel vintage vibe with our tree and other indoor Christmas decor. 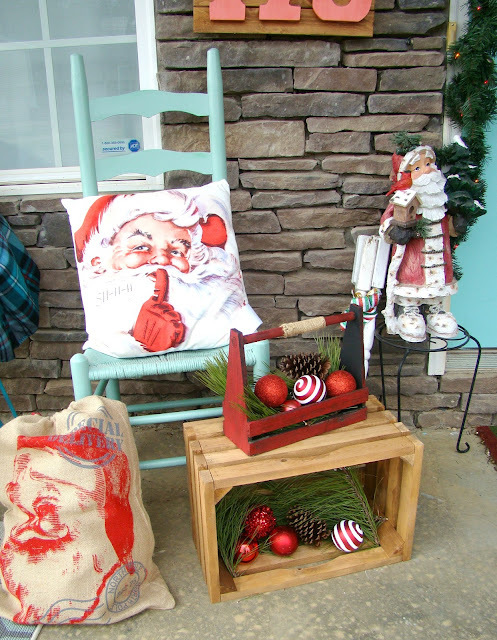 To balance it out, I decided to go more rustic and old school Santa on our porch. I love our little porch because, in a neighborhood of similarly designed homes, our house is one of the only ones with a true porch and not just a deck or stoop. It's one of the things that drew me to this house to begin with. This is the first year I've done this much decorating for Christmas on the porch, as well as lights in the bushes out front. I was inspired by this old Santa portrait I got our first Christmas as newlyweds. I love his kind face, and I knew I wanted to do vintage Santa out here. 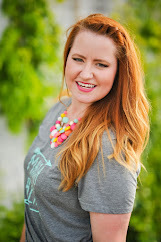 I'm also loving the plaid trend (as is most of the internet). I found the red plaid Christmas balls and the "Merry Christmas" chipboard words at Michaels. I picked up some pinecones at my mom's house, and clipped some pine branches from an empty lot in our neighborhood. I also found some cute rustic ornaments at Target, like the stuffed polar bear head and the burlap wrapped balls. For the tree skirt, I just shoved some extra burlap fabric under there. 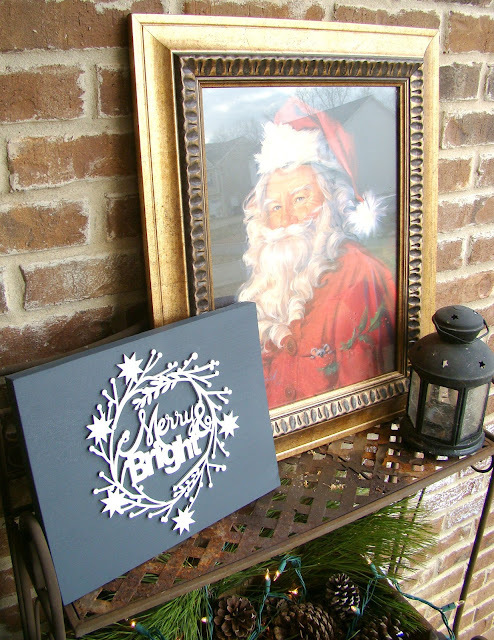 This little Merry & Bright sign was a five minute DIY using scrap wood, chalky finish spray paint, hot glue, and a wood die cut from Michaels. The wooden dairy crate usually lives in my kitchen, but I put it our here to hold more pinecones and a string of white lights. Here's the wreath I made using the bottle brush trees I bleached and dyed. 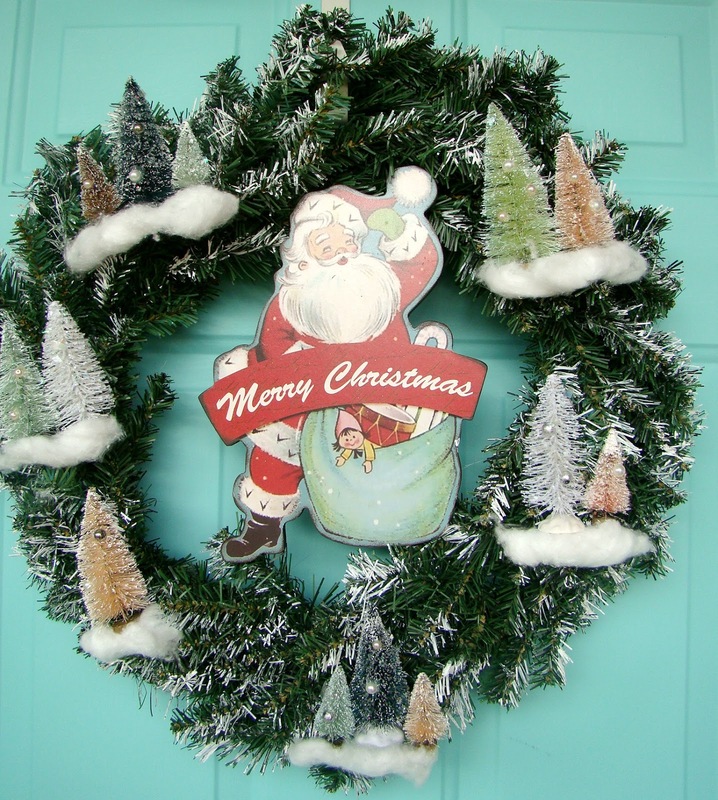 I added the Santa sign I found at Hobby Lobby, and I love the way it pops on our aqua door. Look at that twinkle in Santa's eye! I found the pillow at Hobby Lobby, and the burlap sack from the gift wrap section at Target. 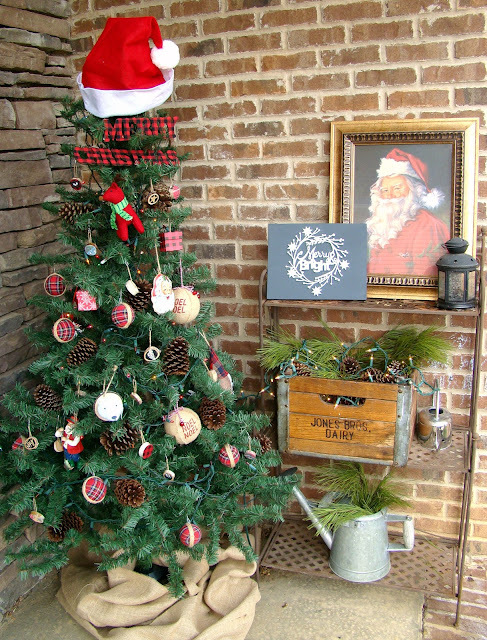 A few spare ornaments and pinecones, and you have yourself a rustic vignette! 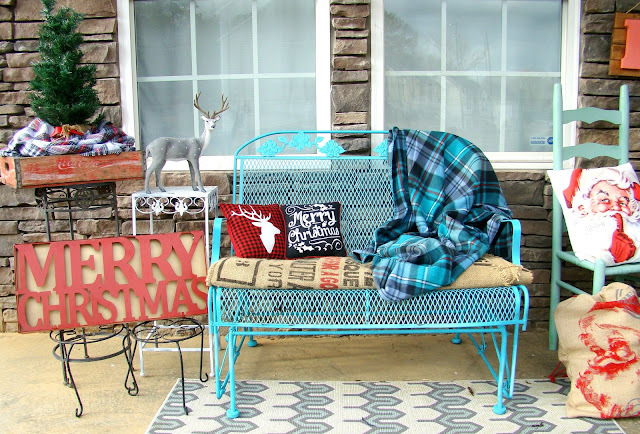 I love the way this plaid throw from Old Navy pulls together the blues and greens from my front door and the glider and makes it work with all the red! I wrapped my existing cushions with an old burlap sack and tossed on some mini pillows from Target's One Spot. 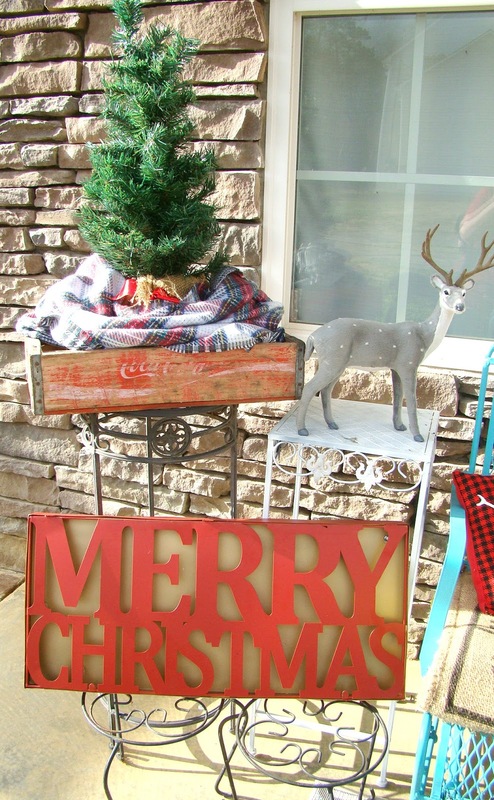 The Merry Christmas marquee sign is from Michaels (I got it 70% off! ), and the deer is from Target. Y'all, I love that deer so hard. We will be finding him a permanent year-round home. If there are any left after Christmas, I'm buying them all so we can have a happy deer family. The Coke crate is from the antique store, and I folded up one of my scarves to make a mini tree skirt for the small tree. 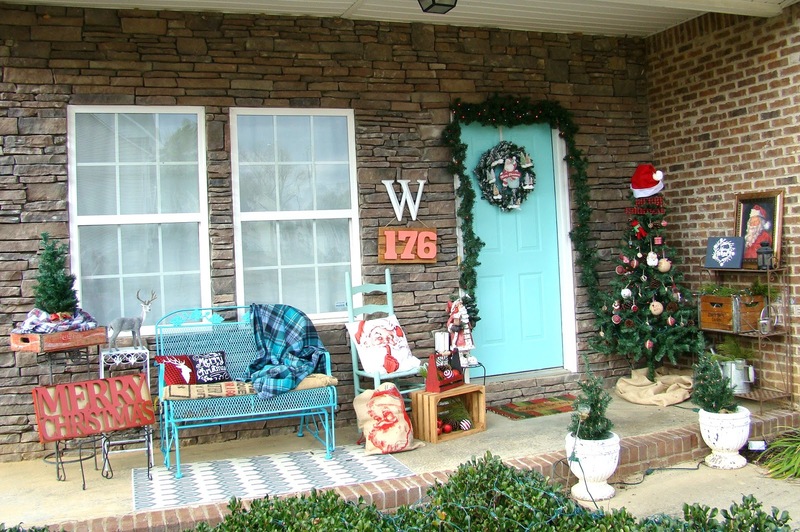 I'm so pleased with how our porch turned out this year! I love driving home at night and seeing it all lit up and happy. Even though it has been 75 degrees this week, it makes my heart light to see Christmas lights aglow all up and down our street. How do you decorate your outdoors for Christmas? Do you even bother especially when it's this hot? How many items from Target's One Spot can one girl possibly need?? Gorgeous decorating. You are really getting into the Christmas spirit. Thank you so much! Christmas is my fave, for sure. LOVE it Callie! Looks so exciting and FESTIVE! Very cool!